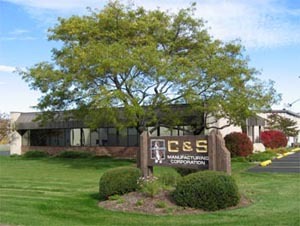 C & S Manufacturing Corporation was founded in 1962 by John D. Collins who worked for many years as a Heating Contractor. After obtaining a patent on his unique “Basset Bracket” the company was dedicated to the manufacturing and selling of time and labor saving products, initially for the HVAC industry. As business grew and new labor savings ideas were developed, the company expanded into the plumbing industry with similar labor saving and code required products. The Basset Products Line of C & S Manufacturing is well known in these industries and is now stocked by over 2,500 Plumbing and HVAC wholesalers throughout the country. As C & S became established in the HVAC industry, custom manufacturing opportunities arose, including sizeable contracts to manufacture metal handles. C & S Manufacturing Corporation is a family owned and managed business and our customers are our extension of that family. 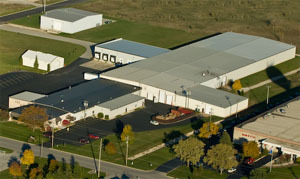 The company, located in the Sturgeon Bay Wisconsin Industrial Park, has steadily grown and at the present time employs 65 people and occupies approximately 115,000 square feet of production, warehousing and shipping facilities. Click here to view our facilities list. Our experienced veteran work force, averaging nearly 10 years of service, along with our wide range of capabilities for high-speed presses to four-slide and multi-slide machines, welding, finishing, to maintenance and warehousing can assure satisfaction to our HVAC OEM, buliding/contractor and other customers on their long and short run needs as well as “Just In Time” delivery with confidence. Luke is responsible for all sales and marketing activities for Basset Products. Any questions should be directed to him either by phone, fax, or e-mail (LCollins@BassetProducts.com). C & S Manufacturing employs over 65 people in its Sturgeon Bay facility with an average tenure of nearly a decade.